A simple, vegetarian recipe that can be ready to eat in less than 15 minutes. 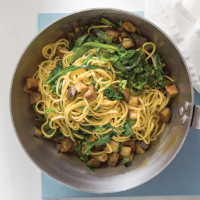 Heat the oil in a wok or large frying pan and add the aubergine, spring greens and salad onions. Cover and cook for 5-6 minutes. Meanwhile, cook the noodles in boiling water for 4-5 minutes until tender, then drain. Add the noodles to the pan with the soy and honey and cook for 1-2 minutes more. This recipe was first published in Wed Mar 11 15:49:45 GMT 2015.